Ahhhh…is there anything more satisfying than opening up a brand new box of crayons? Yes, of course there is, silly 😉 But I'll admit, I looooves me some new crayons. 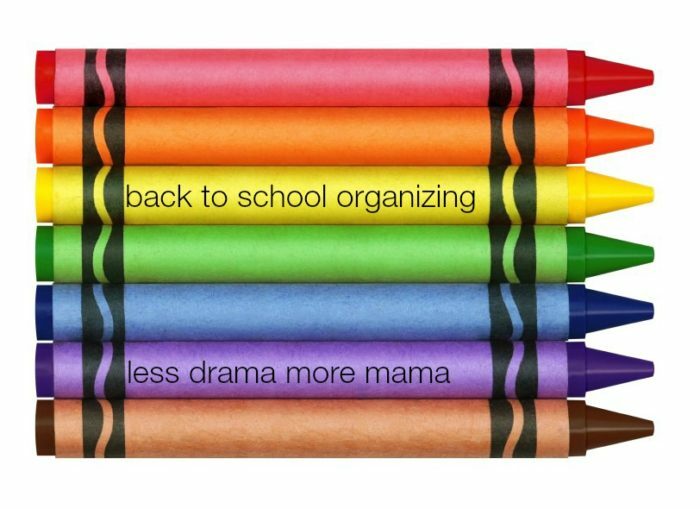 A fresh box of crayons can be symbolic of a fresh start to the new school year. Every Fall, we have the opportunity to sharpen our routines and get organized, so we can be as productive as possible. Last week, we discussed preparing kids for the school year by showing them the calendar, talking with them about the transition, and prioritizing tasks for the remainder of the summer. If you missed last week's post, you can read it here. Don't forget to leave a comment and tell us how it went! 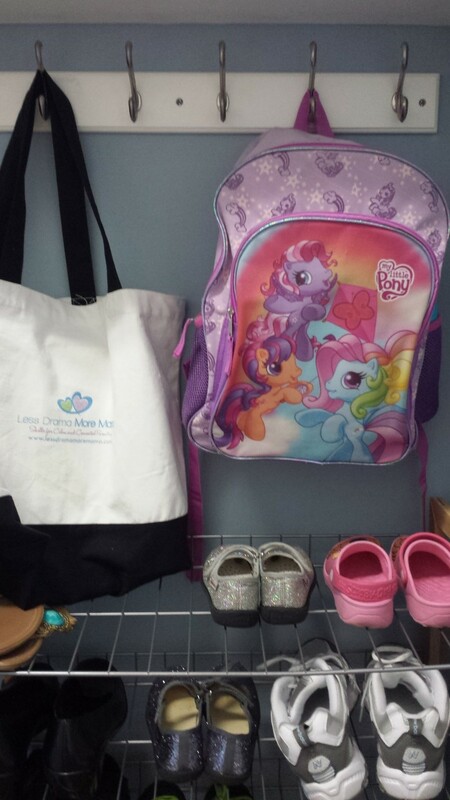 We're continuing the back-to-school organization series this week by tackling physical clutter. Most of us want to start off the school year feeling relaxed and focused. But according to Kim John Payne, author of Simplicity Parenting, environmental clutter can lead to overwhelm and distraction for us and for our kids. The act of organizing itself can feel overwhelming, so set a timer and do a little each day. Ready? Let's go! Before you step foot in a store to buy new school clothes or shoes, make an assessment of what you already have and get rid of what you don't need or use. The clothes in your child's closet should fit and be appropriate for the season. Clothes that are too small or too large can be donated or stored, and clothes that are out-of-season can also be stored in labeled boxes. I prefer clear plastic bins, so I can actually see what's inside. Having fewer choices makes getting dressed a lot easier for kids. It's ok if they wear the same outfits week after week. No one's keeping track (except you). You can keep clothes for special occasions in a separate section of the closet, but school is messy, so buy clothes accordingly. Keep like items together. When kids learn that their socks go in the top drawer and their pajamas go in the bottom, for example, they know where to find things and where to put them away. I even go so far as to separate long-sleeved and short-sleeved shirts, so there's no limit to how you can group things. To take your clothes organizing to the next level, I recommend buying a hanging closet organizer. You can find them in stores like Target and Bed Bath and Beyond, or you can buy this one that has the days of the week printed on it. We have this area right inside our door where we dump place our bags and shoes when we get home. All you need are some hooks and a shoe rack, nothing fancy. I bought everything at Target. 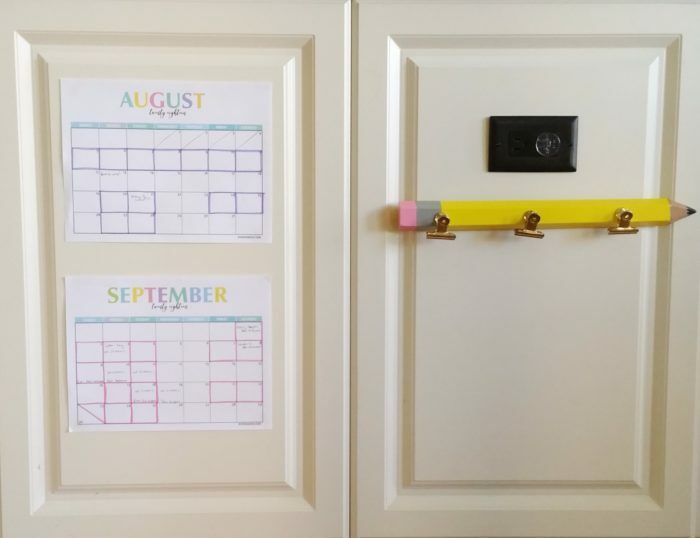 You'll find that when everything has a home, staying organized is pretty simple. Kids understand this concept, too, and can be expected to clean up and put things away, just as they do at school. Here's where things can really start to get out of control. Even though more and more schools are using computers for homework and to communicate with parents, there's still quite a bit of paper that comes into the house every day. Paper can be sorted into three categories – those requiring some sort of action, those to be thrown away, and those to be kept for later reference. As part of your child's daily routine, he can go through his backpack and put action papers (forms for you to sign, reminders, etc.) in a designated spot (e.g. a hanging clipboard, bulletin board or basket). Then, he can toss unwanted papers and put the ones he'd like to save in a labeled file folder or box (e.g. “Johnny – 1st grade”). At regular intervals — or at the end of the year — go through these papers again and keep only the really important or special ones. Another tip: Take pictures of projects or papers you want to remember and make an end-of-the-year book using a site like Shutterfly. Now, if you really want these habits to stick with your kids, you're going to have to practice what you preach. If your child sees you toss your mail on the counter, it's likely she's going to do the same with her papers. As a role model, you need to get in the habit of opening the mail, tossing the junk right away, and filing the rest. You can do it!!! Over the next two weeks, we'll cover routines: morning, after school, bedtime, and mealtime. Make sure you're subscribed to the blog and get notified when new posts come out. In the comments below, tell me what you thought of today's post and your biggest struggles regarding routines and mealtimes. Thanks! This was helpful…my little guy is going to TK this year…and while not quite the big leagues, it will require more consistency in our routine. I look forward to your other posts on that! Getting organized and decluttered is definitely high on my list. I find it so hard in the summer, because we are outside so much. That said, I can’t start the school year the way we are. I love that you include a shopping list in this post. (Getting to Target is the other thing I have trouble doing in the summer—keep putting it off for a rainy day), but I should go soon before the college kids come back. Oh my gosh Pam I love it! Maybe you could come and work for me?! 1. Clear plastic tubs. These are great for both ‘out of sight’ and ‘in sight’ organising styles because it keeps the clothes in one place and you can still see what’s going on in them! 2. Labels – When we moved into our new home our son was six. I put labels on his drawers (socks/undies, PJs, t-shirts, shorts, togs) and they’re still there. It makes it so much easier for him to find what he’s looking for and, most importantly, put his clean clothes away in after they’re folded. If you have little ones that can’t read you can always take a photo or draw a picture (eg of the t-shirts) and pop that on the drawer. I have this saying “If you want your children to grow up and move out you have to teach them to organise themselves”. Sounds to me like your children are well on their way! Helen, if you’re offering me a job in Australia, I accept. Actually, I’ve always secretly wanted to be a personal organizer, but I have to get my own house in order first. So glad this post got your stamp of approval. Thanks for commenting and adding some great tips! Was always fun to get my 4 ready for the next year…..I always took advantage of the good prices for xtras. …..had a shelf in the basement (yes, up north) with looseleaf paper, notebooks, folders, dividers, pencils, etc as a store for the rest of the year, ever need supplies in January.. $$$$$$$$$$$….then there was…….bookcovering…some from those college ones. And of course….the brownbag ones…… many grandmas like me will relate. Oh, I can relate to the brown bag book covers and I’m not a grandma:) I’m pretty sure Marissa had one last year! I’ve always loved back to school. Clean crisp pages. New pens. New systems.